TWEAK is a type II transmembrane TNF superfamily member with high identity to TNF in its extracellular portion (Tumor necrosis factor ligand superfamily member 12, gene name TNFSF12). The TWEAK transcript is expressed broadly in many adult and fetal tissues, however, the staining of human peripheral blood mononuclear cells with monoclonal antibodies shows a more restricted pattern. While freshly isolated PBMCs do not express detectable levels of TWEAK on their surface, IFN-g-stimulated blood monocytes rapidly upregulate TWEAK surface expression. TWEAK is expressed as membrane bound and secreted forms. Interaction of TWEAK with its counter-receptor promotes secretion of IL-8, activation of NF-kB, proliferation of endothelial cells, and apoptosis in a number of human cell lines. Initially, DR3 was thought to be a receptor for TWEAK, but further studies have shown that TWEAK could induce apoptosis via receptors distinct from DR3. While TWEAK exhibits overlapping signaling functions to TNF, it is generally less effective in inducing apoptosis, giving rise to its name, TNF-like weak inducer of apoptosis. The TWEAK Receptor/FN14, also known as Tumor necrosis factor receptor superfamily member 12A precursor (gene name TNFRSF12A) or fibroblast growth factor-inducable 14 kD protein, is distantly related to the TNFR family, containing one cysteine-rich domain in the extracellular region and a TNFR-associated factor binding domain but does not contain a death domain (DD) cytoplasmic region. TweakR (FN14) plays a role in TWEAK-induced endothelial cell migration, proliferation, and angiogenesis. TWEAK-induced cell death via FN14 includes both apoptosis and necrosis and can be blocked by an anti-TWEAK antibody, CARL-1. FN14 is expressed on HUVEC and in some cancer tissues but not on freshly isolated PBMCs. FN14 mRNA expression has been identified during liver regeneration. OriGene Technologies offers a range of monoclonal and polyclonal antibodies to Tweak and TWEAK Receptor, suitable for flow cytometry, ELISA or other immunological applications like immunohistochemistry or Western blotting. Fig. 1: AP07793PU-N TweakR antibody staining of Formalin-Fixed Paraffin-Embedded Kidney tissue. Fig. 2: Western blot analysis of TweakR in A) human liver lysate , B) mouse liver tissue lysate, and C) rat liver lysate using SP7209P at 1/500. Fig. 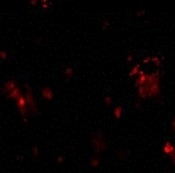 3: Immunofluorescence of DcR1 in rat liver tissue with AP30279PU-N DcR1 antibody at 10 μg/ml.